Last year, the world was all excited about Twitter. 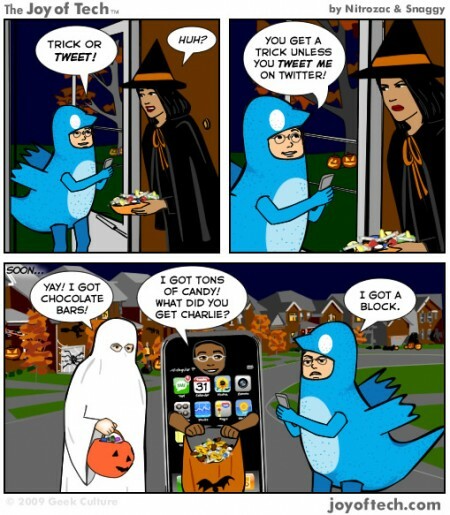 Here are some funny comics about it from Joy of Tech. I fully expected Twitter to be dead or bought out by now. It continually amazes me that it is still around today. Last year, The Guild made a Halloween episode. Unless you’ve watched episodes of The Guild, this Halloween episode might not be very funny to you because it’s packed with inside jokes. The series is brilliant, though, so check it out! According to WGhost9, it is a lot more complicated than it looks. Introducing the Creeper 2: My brand new hexapod. Mike and I have a Halloween pumpkin that rolls around the floor making farting noises that we fill with batteries every year. I really should take a video of it for posterity. I would be heartbroken if it ever quit working. I love this costume. It looks like an 8-Bit rendering of her face. All it takes are some makeup skills and simple patches sewn onto a plain shirt. I wonder how it looks when she closes her eyes. Excellent work! This year, our Halloween theme is 60’s and 70’s. 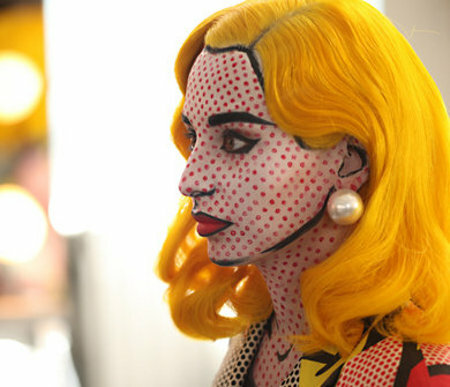 I absolutely LOVE this costume idea because it reminds me of the Roy Lichtenstein paintings in the Sixties. This was created by a M.A.C Cosmetics artist for Halloween last year and I think it’s genius. They started by using white makeup on her face and then added the black lines to highlight the features. 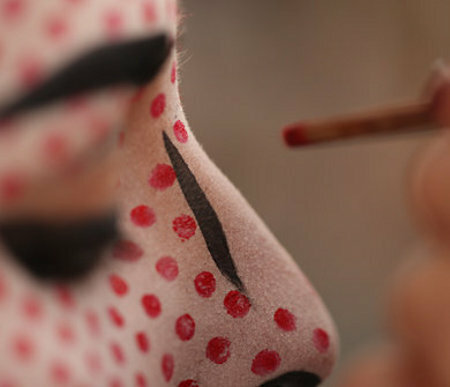 Then they used a dowel twisted into red lipstick to create the red dots on the face. The finishing touches include a bright yellow wig, oversized earrings and a dress made from polka dotted material (which might be the most difficult part of making this costume). One note of caution: if you are going to a Halloween party, this kind of makeup is VERY difficult to keep for an entire night. One touch to the face, and the image is ruined. Make sure you do a test run at least two days before your party so you can perfect your technique and practice NOT touching your face for the month before so you have a chance of living through the night without smearing your own makeup. 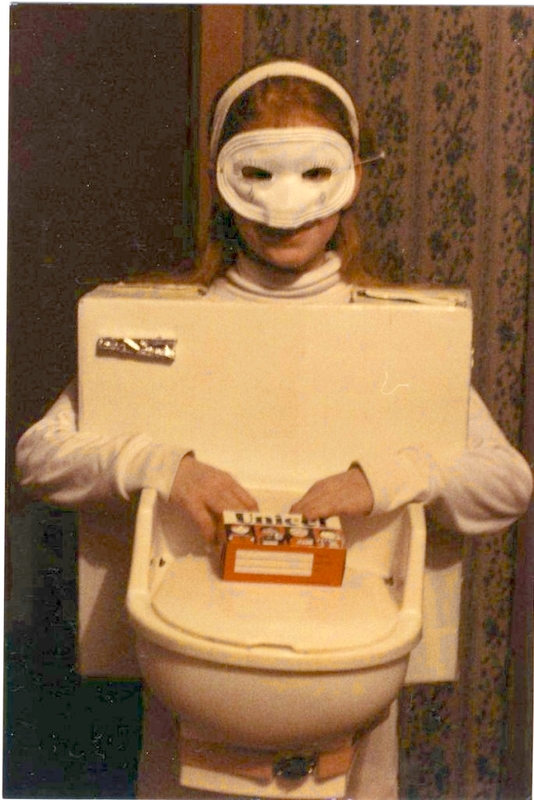 I love the inventiveness of this Toilet Bowl Costume from Carolyn Terlet. It looks like a Porta-Potty connected to a white box. Add a white mask, turtleneck and leggings for the finishing touches. They used a flushing handle made out of aluminum foil and a clothes pin, but a REAL toilet handle is pretty easy to come by at the hardware store, so I’d go that route. According to Carolyn, the candy went in the toilet bowl. Brilliant! I love this old advertisement from Coty cosmetics. 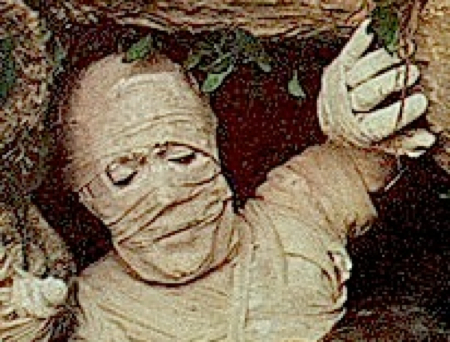 The Mummy and the Wolfman are two classic monsters that we just don’t get to see anymore. Sure, there are scary mummy or werewolf movies, but they have changed so much since the Boris Karloff and Lon Chaney days. 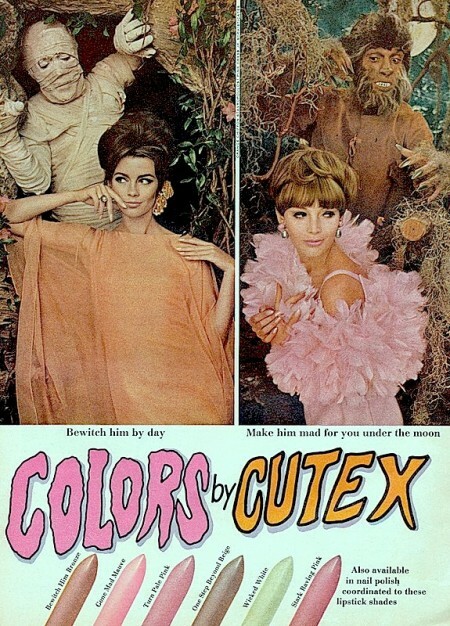 This advertisement just brings back all of that classic Monster Mash to me. 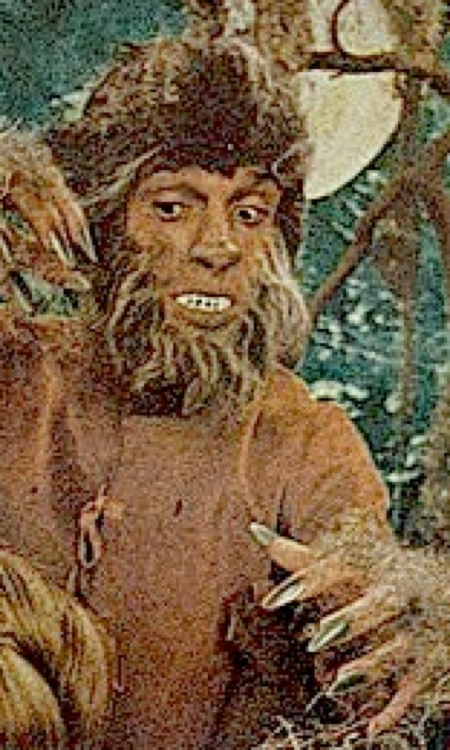 Here is a closeup of the Wolfman. And a the detail for the Mummy. 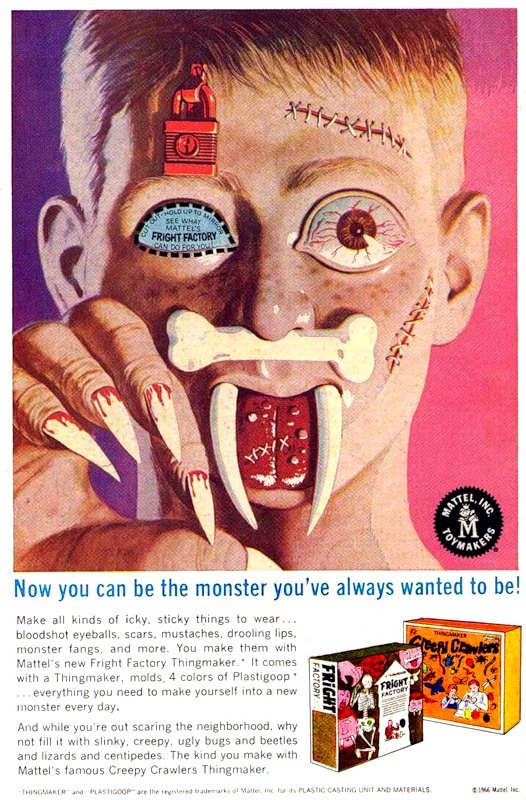 Now you can be the moster you’ve always wanted to be! Make all kinds of icky, sticky things to wear… bloodshot eyeballs, scars, mustaches, drooling lips, monster fangs, and more. You make them with Mattel’s new Fright Factory Thingmaker. It comes with a Thingmaker, molds, 4 colors of Plasticgoop… everything you need to make yourself into a new monster every day. And while you’re out scaring the neighborhood, why not fill it with slinky, creepy, ugly bugs and beetles and lizards and centipedes. The kind you make with Mattel’s famous Creepy Crawlers Thingmaker. The best part of this ad is that you can cut out one of the eyes and wear it as a mask. I think I would have loved this toy, but I’m pretty sure I would have burned myself with it. I still have Easy Bake Oven scars. I am enthralled with this computer generated walkthrough of the Haunted Mansion at Walt Disney World. If you play the game Counter Strike on the PC, you can download this and other Halloween inspired maps to play on the game. This walkthrough is so good that it makes the REAL Haunted Mansion walkthrough a little disappointing. Check out this great video from Disney celebrating the 40th Anniversary of the Haunted Mansion. Disney goes all out for Halloween. 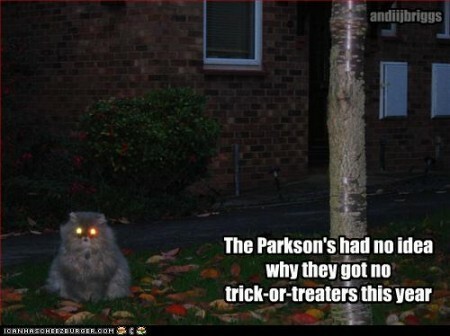 Via: The Parkson’s had no idea « Lolcats ‘n’ Funny Pictures of Cats – I Can Has Cheezburger? 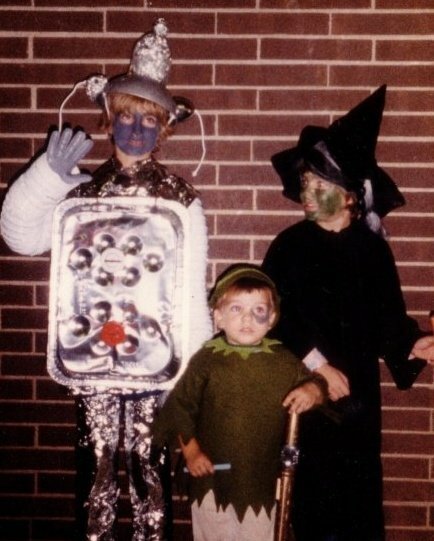 I love this photo of a family of kids all dressed up for Halloween as Wizard of Oz characters: Tin Woodsman, Scarecrow and Wicked Witch. The Tin Woodsman is made out of a aluminum turkey roaster. Brilliant! 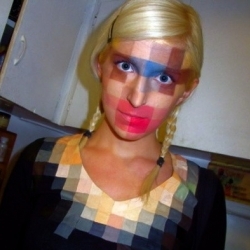 If you’re at a loss for what to do for a costume for Halloween this year, this idea is perfect. Just wear a black turtle neck, black pants, and spray your hair black and the makeup will do the rest! Here is his version of Miss Piggy and Kermit. This body builder job is AWESOME! If you go as this Cyclops, you’ll have to walk around sideways all night at the Halloween party, but you’d be a shoe-in to win the costume prize. 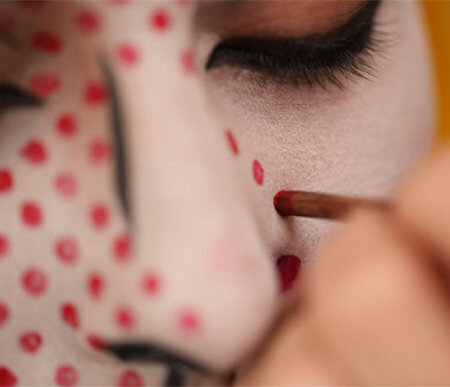 With just a little bit of face makeup, you can be the life of the Halloween party! Make sure you do a couple of test runs before the big night so that you are able to do it without pressure. Good luck! I wish I could buy a version of this song online. Why haven’t they released it?! I found this photo on AwkwardFamilyPhotos.com, but this family doesn’t look awkward to me. 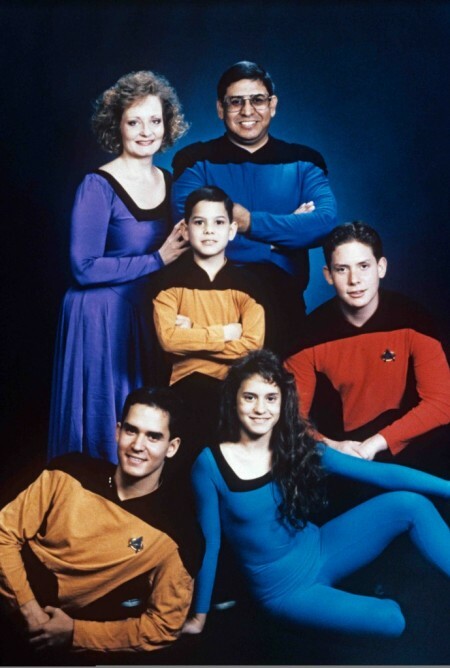 All of them (except Mom), look totally stoked for a Star Trek: Next Generation family photo. I especially love the daughter’s Counselor Troi outfit with beautiful matching hair. They all look so awesome! 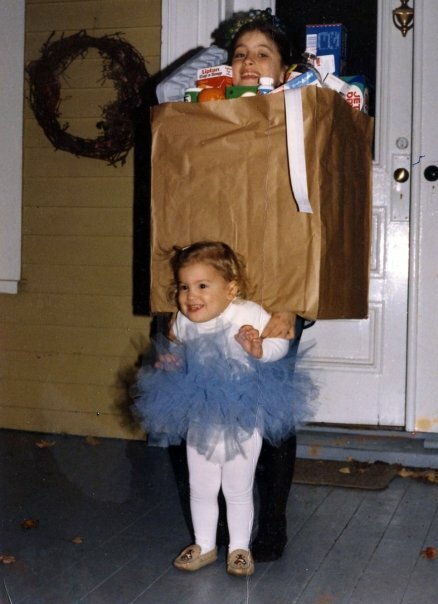 Alex’s little sister got to be a ballerina, but Alex had the best costume of all: a bag of groceries. I love the receipt dangling out of the bag in one long strip. It’s the perfect touch. Awesome costume, Alex! Keep up the good work! I have been vaguely amused by Angry Birds on the iPad, but the fact that Rovio came out with a Halloween edition of the game shot them to number one on my list. Here is a video showing the action. Angry Birds Halloween for the iPhone – Rovio Mobile Ltd. Angry Birds Halloween HD for the iPad – Rovio Mobile Ltd.
It’s funny how something as simple as a two dollar video game can make me so happy for the holiday! 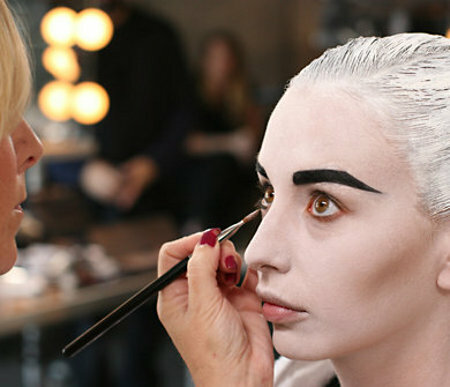 Check out these awesome makeup tutorials from Sephora! They make me want to run right over to Sephora and buy a bag of false eyelashes, glitter spray and black lipgloss! What makes this look really pop are those red contacts she’s wearing. Flingsoft has brought us a huge collection of old movies that you can stream onto your iPad. I thought maybe all of the movies would be really bad, but there are some good ones there including: Dementia 13 (directed by Francis Ford Coppola), White Zombie (with Bela Lugosi) and The Last Man on Earth (with Vincent Price). There’s nothing like a bunch of scary movies to make Halloween feel even scarier! Eve Pearl is a makeup artist who works at The View. Here is a clip showing how she transformed the crew into a bald biker guy, a Planet of the Apes character, Linda Blair from The Exorcist and Pinhead. She used real nails for the Pinhead costume. I don’t think that’s all that safe, if you ask me. Can you imagine showing up in the emergency room and having to explain how you injured yourself by trying to make a really cool costume? !